The first 20 people who text their email address to 410-635-4474 will receive 4 free bottles to try! 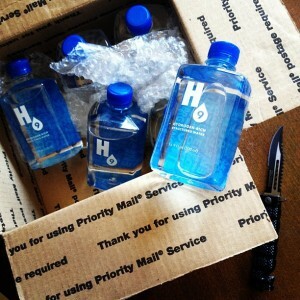 H9 is six times more hydrating than regular water and packed with a proprietary blend of humic and fulvic acid mineral formuls, magnesium chloride, vitamin B 8/inositol, MSM-ionic sulfur, Kona Hawaiian sea mineral crystals, nano coral calcium, sentramin, ionic silica, organic plant derived colloidal minerals, monoatomic gold and silver trace minerals, electrolytes, enzymes and amino acids. The 9-step patented process makes H9 unique. It is considered the fourth phase of water which is H3O2, structured water. H9 water has optimal alkaline levels. There is so much to say about H9 water, call Keith and Shannon French at (410) 635-4474 or email at info@KeithandShannonFrench.com for more information on the product or becoming a partner in this ground floor opportunity. Now is the time to join! H9 is “disruptive technology” that you just have to try for yourself! Join the H9 revolution today! H9 Water Website < visit our website for more information!